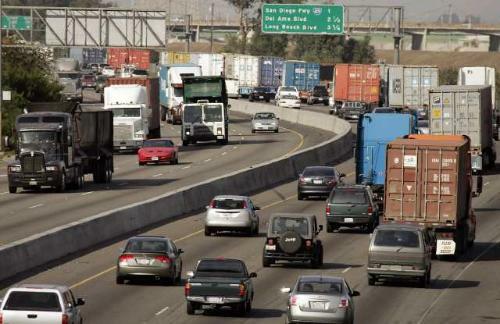 The possible expansion of the 710 Freeway cleared two hurdles Wednesday afternoon as two committees for the Los Angeles County Metro Authority pushed the project onward to the full board. The debate was between two alternatives identified by planners, one (5c) costing about $6 billion and “alternative 7” which would cost about $10 billion. Both projects would change the current layout of the current 19-mile stretch of the 710 that runs from Long Beach to East Los Angeles. They would improve on interchanges and local on- and off-ramps with some portions of the freeway being widened to bring the 60-year-old freeway up to current standards. Where 5c and alternative 7 would differ is that the latter would create a separate “clean emissions corridor” which would separate truck traffic from the normal flow of other traffic. While both projects say they will improve congestion and lower pollution levels, community members have pushed for a plan that includes a zero emission corridor, and eliminates displacement of homes—a possibility in some instances as the freeway is widened—and a local hiring element for when construction begins. The project is expected to hit the full board in September, with completion of the 710 improvements forecasted to be completed in 2040. In Metro’s Ad Hoc Congestion, Highways and Roads Committee meeting Wednesday morning, Fourth District Los Angeles County Supervisor Janice Hahn, who chairs the committee and represents Long Beach, proposed a change to 5c, noting that at $4 billion less, it would likely be the choice that a majority of her fellow Metro board members would favor. Metro’s programming and planning committee, which took up the project separately, made no suggestions for the full board. The changes Hahn proposed would alter the language of the alternative to include zero emissions, rather than near-zero emissions, when talking about a proposed phased-in truck program, increasing funding for that program by double to $200 million, including incentives for zero emissions long haul trucks and other vehicles, including a proposal to have a zero emissions-only lane that runs the full 19-mile stretch. While some members of the public that gathered to speak at the committees’ meetings today acknowledged the improvements to 5c, they did not back down from their original stance that both alternatives were lacking. The plan is being opposed by a number of community groups up and down the freeway, including the Coalition for Environmental Health and Justice (CEHAJ). In a letter to the committee, the coalition said that it should ask CalTrans to mandate zero emissions in the project as well as a project labor agreement that would benefit local workers. In addition to displacing some residents, the project may also shutter the Long Beach Multi-Service Center where the city provides services to the homeless. The corridor improvement project has dragged on for years with the plans being initiated in 2018. Ernesto Chaves, who presented the project to the committee, said that 5c would have less impacts on rights of way, and because it has an added lane for regular traffic the level of service would be better with the cheaper option. Chaves added that pollution will naturally be reduced under all scenarios if more near-zero and zero emission trucks are introduced. The Ports of Los Angeles and Long Beach recently updated their clean air action plan which sets timelines for when it expects operators to have those kinds of trucks in their fleet or pay a yet-to-be-determined amount of fines for operating older, more polluting trucks. Jorge Rivera, the program director of Libre, a Long Beach tenants rights group, said that the communities impacted by the pollution from the port and the 710 deserve better than what’s been outlined thus far. Leanna Noble, a Downtown Long Beach home owner, questioned why the 710 Freeway could be stopped from expanding into more affluent neighborhoods to the north while the board considers expanding it in poverty-stricken areas in the south. The 710 Freeway abruptly stops in Alhambra, leaving a 4-mile gap between it and the 210 Freeway to the north. The fact that the freeway has not been completed has been a point of contention in Alhambra where banners regularly fly with slogans pushing for the 710 to be finished. In May, the Metro board voted unanimously to pull support from a $3.2 billion project that would have connected the two ends of the 710 with a freeway tunnel.